A quick tour of Prague in two hours. A sightseeing route by air-conditioned bus will take you to Prague Castle, where you will take an hour's walk around the castle with a guide. The tour finishes at Prague Castle. This sightseeing tour is a perfect option if you really don’t have much time left. 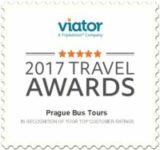 During the first part of the tour you can admire the National Museum, the famous Dancing House, both the historic and new stages of the National Theatre, the unique Charles Bridge and the panorama of Hradčany from our air-conditioned bus. This is followed by a walking tour of the Prague Castle exterior with a professional guide, which is where your tour will finish. We have prepared for you the best offer through which you can enjoy a trip by modern bus with complete on-board services and an experienced guide at a bargain price. This advantageous offer, unlike the basic price, does not include certain additional services such as admission and meals. It will be announced by email or telephone.